I’ve never been greatly convinced that curved TV screens are anything but a passing novelty. Watching TV is a social experience, so optimizing the viewing angle for just one person seems odd. 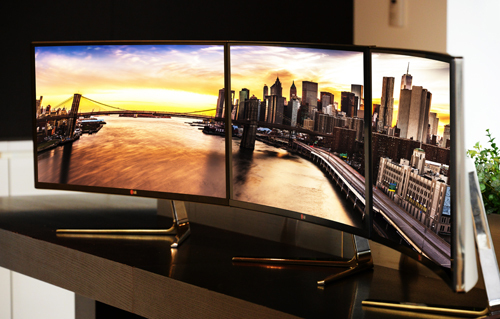 But a curved monitor makes much more sense to me, enabling more comfortable viewing from a fixed position at your desk – especially as monitors get larger. The Quad HD resolution display gives digital photographers and filmmakers the level of detail and accuracy that their work demands. Compatible with both PCs and Macs, the LG 34UC97 monitor easily handles heavy graphics and videos with ease on either system and supports Thunderbolt™ 2 for high-speed data transfers — four times faster than USB 3.0 — and allows multiple devices to be daisy chained together. The monitor also features MAXX AUDIO® and 7W stereo speaker system guaranteed to deliver peak audio performance across all frequencies. Looking at the above photo, it also seems to look pretty cute. LG said that it will also be launching a 31-inch 4K monitor, as well as a lower-resolution 31-inch monitor aimed at gamers. No pricing or availability has yet been announced. Apple is believed to be working on a 4K display, though nothing is yet known on timing. What are your views? Are you holding out for 4K, or is matching the 1440 vertical resolution of the existing Apple Thunderbolt Display while extending the width to fit in more horizontal pixels a good compromise? Does a curved monitor appeal? As ever, let us know in comments.